In the fall of 2011, I was driving to work, chatting happily with my car pool. Even though my daughters were both away at college, I ferried two high school girls, family friends of ours, to the neighborhood where I teach so they could walk to their school each morning. One day in the school neighborhood, we saw a woman walking her dog and I remarked, “Look at that adorable dog. I’ve always wanted a Westie.” One of the girls then responded that they knew someone looking for a good home for a Westie. Would I be interested? My mind raced. I had always been told that Westies were very territorial and being a terrier, had been bred to hunt for small furry things, so a Westie plus a cat normally does not equal a happy household. I also thought of my husband and his reaction to this proposal. We had talked about having a dog before, and he had always been opposed to it. I’ve always been a cat person. It seems there was always a cat in my life, even as a little girl. We had an outdoor cat named Pencil when I was growing up. His name came from the scar on his forehead, which was shaped exactly like a pencil. Pencil was very unusual in that he did not care for cat food, but loved leftover vegetables from our family dinners. I remember bringing out a paper plate of broccoli for him many times. I also had a white Persian cat named Princess. She was most definitely an indoor cat, with regal bearing to match her name, and beautiful long hair that shed everywhere. My mother had always been opposed to having an indoor pet, but once she was given to me, it was obvious that she had to be kept indoors, and she was resigned to my bedroom. One morning as my dad left for work, she unknowingly crept out with him, and fell in the drainage canal behind our house. She was found later, covered in oil. She did not survive her foray into the outdoors. We had another cat, whose name escapes me, when one of my brothers was still in diapers. My mother had developed a system for taking his dirty cloth diapers out of the house; she would open the kitchen door to the garage and throw the diaper the short distance to the washing machine, where she would leave the washing machine lid open. Once she had accumulated enough for a load, she would then go into the garage, add soap, close the lid, and turn the machine on. One day, she followed her procedure, but within minutes of the washing machine filling with hot water and starting to agitate, we could hear a terrible noise coming from the garage. My mother knew instantly what had happened. The cat had crawled up inside the back of the washing machine and was caught in the machinery. She ran out to the garage and turned the washing machine off. The cat screeching continued. We were all crying and carrying on and my dad was away at work so she called my Uncle Guy, who owned a grocery store in my hometown. My Uncle Guy told her it was probably too late to save the cat, and since it was late in the day, she should just wait for my dad to get home. Eventually the cat screeching stopped, and our own screeching became louder and louder, knowing what this meant. My dad was not happy to come home from a long day at work to this news. The situation worsened when she told him that the washing machine was full of dirty diapers, detergent, and now tepid water. He changed clothes and went out to the garage, cursing and muttering about the task at hand of first emptying the washer and then turning it on its side to sort out the mangled cat remains that await him. He set a bucket on the garage floor next to the washer and opened the lid of the washing machine to start removing the dirty diapers. Out flew the cat, soaking wet and very smelly, clawing my dad in the process of making his escape. He had been inside the washer the whole time, not mangled in the machinery. In the early 80s I arrived at my office for work early one morning. I unlocked the front door and went in, heading straight for the coffee pot, to start the first pot of the day. I could hear a soft mewing sound coming from the ladies’ bathroom near the coffee station. There to my surprise I found a beautiful Persian cat. I called the local vets to see if anyone had reported a lost cat and then took her home with me, after purchasing a litter box and cat food. I put signs up in the neighborhood surrounding the office building, but received no calls. The cleaning people reported that the cat was always hanging around the office building in the late afternoons when they were coming in to clean and she must have snuck in when they were bringing in their cleaning supplies. I named her Muffin and had her checked out by the vet, who said she was either a full pedigree or close to it. She was a Russian blue and absolutely beautiful. One of my neighbors found out I had adopted a Persian and asked if I was interested in breeding as he had a pedigree male. Eventually Muffin was declared pregnant and gave birth to two miniscule things that did not look like kittens at all. Not only did I think they looked like aliens, she thought so, too, and abandoned them at the bottom of my stairs, near the return vent for the air conditioner. I put them in a shoe box and brought them to the vet who told me they were weak and sickly, which is why she abandoned them. I fed them with an eyedropper day and night for several days before they both died. He was my baby, though, long before I had babies of my own. While Muffin had always been somewhat aloof, typical of most cats, Mozart was very affectionate and very much aware that I had been sitting on the floor next to the box the minute he was born. When I drove up the driveway of my house after work, he would be waiting at the front door, and when I opened that door, I better be ready to catch him, because he would leap up into my arms. He would crawl up so that he could rub his head against my face, putting his paws around my neck like he was hugging me. When Muffin died in 1992, he became even more attached to me, even though I had a two-year old and a newborn baby to care for. Timing could not have been worse. I had been visiting a friend one Saturday when I was nine months pregnant with my second daughter. When I returned home, my husband sat me down at the dining room table and gave me a grilled cheese sandwich. I told him I wasn’t really hungry, as I had already had lunch, but he insisted that I eat at least some of it. (Somehow, the grilled cheese sandwich was supposed to make the impending bad news easier to swallow.) He then told me that he had brought Muffin to the vet because he had found her lying next to the washing machine (those damn washing machines) in a very strange position and somewhat non-responsive. The vet had examined her and said that she was in pain with a mass in her stomach. So off to the vet we went, with me nearly hysterical over the death of my cat, and full of late pregnancy hormones. Maddie was born on Monday morning, amidst tears of joy of a safe delivery, relief over a healthy baby, and grief over my sweet Muffin, all mingling together. Mozart met the same fate as his mother, although the mass in his stomach was preceded by kidney and heart disease, and at one point, he was taking the same blood pressure medication and fluid pills as my mother. After he died, I found it difficult to walk into my bedroom in the evening, imagining him asleep in the rocking chair where I nursed my daughters and rocked them to sleep. 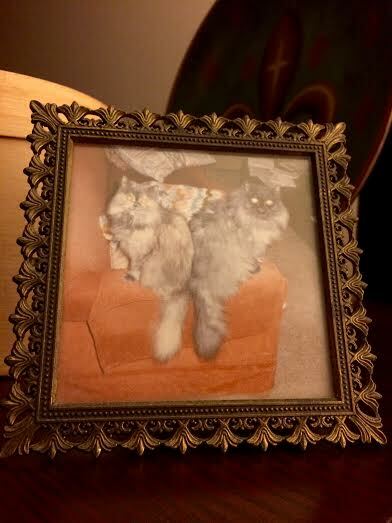 We eventually adopted Smokey, another charcoal grey Persian, who had the distinction of accompanying us overseas for our two years in Belgium, making his transatlantic flights in his carrier under the seat in front of me. Smokey was eleven years old when my high school friends told me about this “Westie” that was up for adoption. The Westie was supposedly two years old and very sweet. Initially my husband said no to the whole idea, firing away with all the obvious reasons not to get a dog: who will walk him, what will we do with him when we go out of town, how would he get along with Smokey? My young friends soon reported back that a home had been found for the Westie so the matter was put to rest. For a brief period, that is. Several weeks went by when they reported one morning in the car that the original plan had fallen through and the dog was still up for adoption. Oh, and his name was Puccini. This is when I thought that fate was knocking at my door. I had named a cat Mozart, after all. My husband had studied music in college as a voice major. This dog was in perfect health, was being given away with all of his accoutrements, our friends had always dog-sat for him when the owner had gone out of town, and they said they would continue to do so for us as well. It seemed too good to be true, so we decided to investigate further. An appointment was made for us to meet Puccini and his owner, Sister Marie, a Catholic nun who was returning to her convent in Connecticut after living and working in the DC area. The dog, which we learned was not a Westie but a Maltipoo, was four years old, not two. Sister Marie brought him over for a visit, and then a few days later, she brought him to us to keep him over the 2011 Thanksgiving holiday as a test run. She wanted to be sure we were the right family for him, especially since we had not owned a dog before, and we all wanted to see if he and Smokey would get along. The trial run went well. He is an adorable little scamp and very entertaining. Our girls came home from college and we all enjoyed playing with him. His number one priority, however, was eating the cat’s food, and mucking about in Smokey’s litter box. We had to purchase baby gates and devise elaborate systems to keep him out of Smokey’s area. We also had to ensure they were not left alone together because Puccini desperately wanted to get up close and personal, and Smokey wanted absolutely none of it. The spitting and hissing did not seem to deter Puccini, and they frequently were in stand-off positions on opposite sides of the sofa in the den, or at opposite ends of the stairs. Again, however, timing could not be worse, and as we were packing our car to drive to Pittsburgh for our older daughter’s college graduation, with our elderly fathers in tow, we found Smokey lying in that now familiar awkward position, not wanting to get up to eat or drink. We waited at the vet’s for the doors to open and one of the technicians called the vet at home to discuss the situation. The vet said he was on his way in to examine him, and ordered an x-ray in the meantime, when Smokey passed away. And then there was one. He is now the king of the household, the little prince as my husband sometimes calls him. Four years on, he has us all wrapped around his little paw. He is smart as a whip and very protective of our house and yard. He loves everyone he meets, with the exception of anyone in a mail truck or walking the neighborhood carrying a mail bag. He is on a daily mission to catch a squirrel, scare away the deer that frequent our yard, advise us, with fierce growls, of any new lawn decorations or suspicious garbage containers that appear on our street, and always, on red alert for any brown dogs. He is sixteen pounds of pure energy and charming personality. A year ago when I embarked on this “essay a week for one year” project, my first essay published on my brand new website was about Puccini. It’s only fitting that, as my year-long mission to becoming a writer comes to a close, I write about Puccini once more. 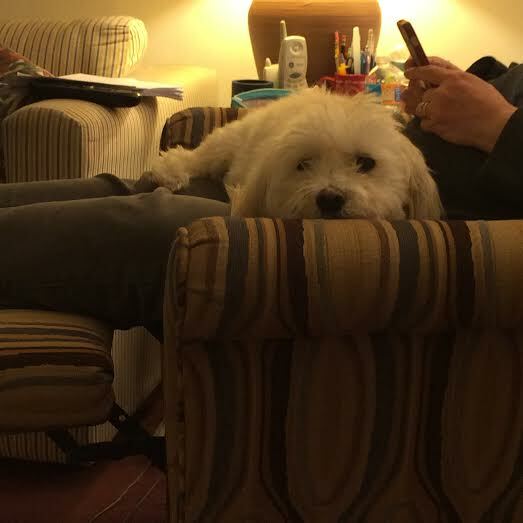 As I write my essays each Sunday, he is on the love seat in our home office, my constant companion, my little shadow. He follows me from room to room all day long and sleeps pressed up against my side each night. While I will always love cats, as evidenced by the cat knickknacks and art work displayed all around my house, he has turned me into a dog person, and he has hands down won the heart of my husband as well. He is the reason this die-hard couch potato goes out for walks in all sorts of weather, which has helped me improve my own health. And, even more significantly, even though we had lived in our house for seven years when we first adopted him, we knew almost no one on our street. Now, with our many doggie walks throughout the day, we have become friendly with our neighbors up and down the street, both those with dogs and those without. We gave him a home, but he made us at home in our own neighborhood. Another great essay. I’m so proud of you! Thank you for not calling out Charley. Your little Puccini was and is a great addition to the neighborhood. Merry Christmas to the Ardillo Family!